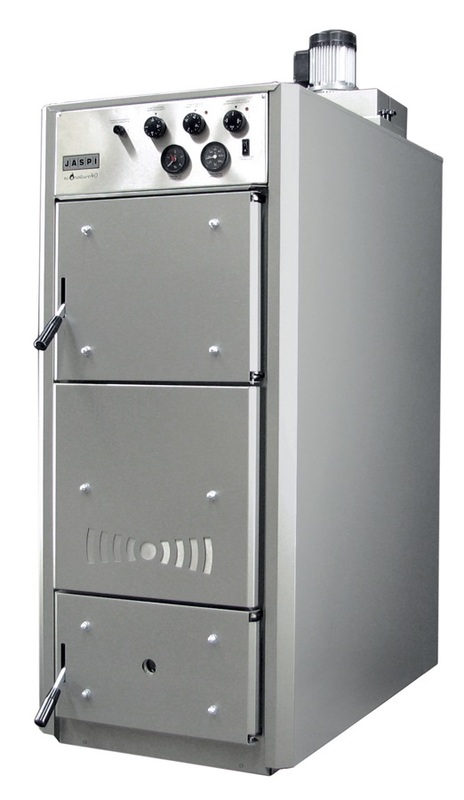 Econature 40 is a powerful, clean burning solid fuel boiler for the most demanding applications. This new generation wood gasification boiler has a considerably higher efficiency than that of a conventional wood-fired boilers. The Econature boiler offers users with 91% efficiency, which brings the solid fuel burning close to the best new oil and gas boilers. The boiler capacity is 40 kW and the large wood furnace takes around 30kg of 500mm logs to produce a massive 100kW of heat in one burn. This takes only 2.5 hours. Econature must always be connected to a thermal storage tank for recharging (1500L to 3000L recommended). Econature's ceramic burning grate and afterburner guarantee a very high combustion temperature. This high- temperature burning is a clean combustion process that produces little tar and very low NOx emissions. Moreover, the process provides the best accumulation of energy released by wood burning. The combustion process happens on ceramic fire crate whilst a blower fan provides balanced and optimized downwards draught. Gasification of firewood begins at a temperature above 100°C and as soon as the temperature exceeds 280°C, useable heat and burning gases start to be released. Secondary combustion begins at a temperature over 600°C. This bright white flame can be observed through a small window at the lower part of the boiler. The high temperature combustion reduce firewood consumption as well as reduces the amount of ash produced. Clean combustion and the obtained environmental certificate also make it possible to use the boiler in densely populated areas. Once firewood is completely burnt, the blower fan will stop automatically so that you will not have to go to the boiler room after the last filing of the furnace. The boiler pump thermostat will control a charging unit mounted between the boiler and the thermal storage tank and ensure that water entering the boiler from the thermal storage tank is hot enough. Also this will turn off automatically once the boiler has cooled down. Boiler overheating protection will also switch off the blower and this in turn will stop the burning process. Econature has been tested as per EN303-5 and not found to meet and exceed all the requirements of the standard. The boiler does not require thermal safety valve, connection to mains water or additional cooling coil. The EN 303-5 testing demonstrated an average efficiency of 91% in a five-hour combustion cycle. It is however important to keep in mind the quality and moisture content of firewood. The moisture content should be less the 25% to achieve better efficiency, Operation and maintenance can be done at the front and on top. Sensors and controls are located on the front at a convenient height. It is essential for this boiler to be connected to a thermal storage tank, the recommended size is 1500 to 3000 litres. The connected thermal store must be large enough to handle at least one full load logs, up to 100kW, this is achieved with a 1500L thermal store. If several loads are burned without taking the heat out from the system (radiators / DHW) then the thermal store must be bigger.